Me by the window, enjoying the sun as I draw. I got to sit down instead of standing up! All coloured up. sunning myself indoors! This took forever!!! No pencils once again, done with a 01 Staedtler pen and coloured with staedtler fineliners and mepxy and copic markers. Whoo! I spent my whole morning drawing this piece. The pieces are not very big at all, like half an A4 size and yet this took me hours to get done. This took almost 4 hours!!! I should do bigger and more finished pieces at home, based on the sketches I do when am out and about. I was onn my opwn sketching in the morning and I couldn;t go to the bathroom or eat until the piece was finished, otherwise I would have lost my spot! Priorities, I know. I spent the whole day drawing recreationaly and eating too much and therefore spending too much. 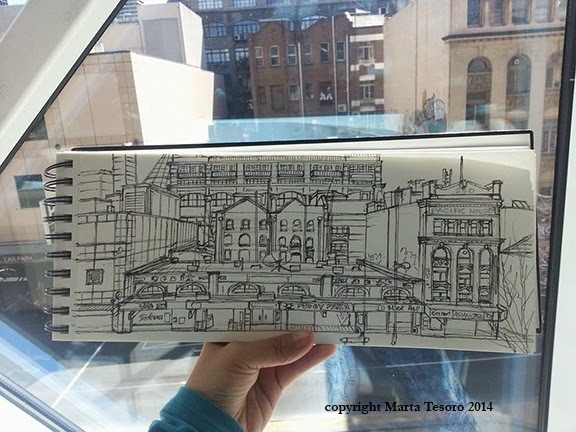 I was out with urban sketching friends and it was so lovely to spend the whole day with them. There are some developments with the urban sketching and it involves me so more news on that later when it comes to fruition. I need to be good (as much as possible) this week to make up for the spending though! After all, my contract for animating Psychobutts ends shortly and I'll be in freelance limbo or madness, whichever one, again. I do enjoy this whole going from place to place and drawing though! However, once the job ends, perhaps bringing packed lunches or breakfasts would be ideal. 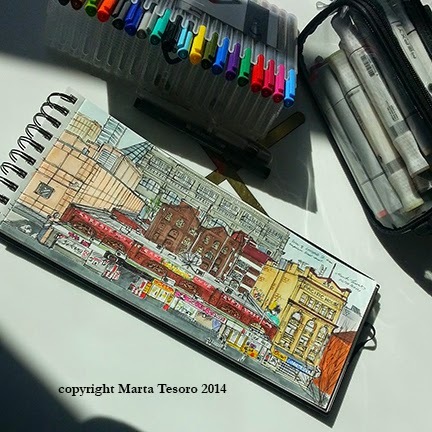 Urban Sketching: Mailing Road, round 02!